March 19, 2019 Arthur Mintie, Sr. This article focuses on design concepts that should be incorporated into plans and specifications for curbless showers in new construction. 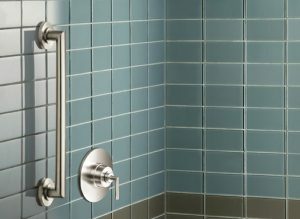 Other challenges and options come into play for curbless showers when these design requirements have not been included (e.g., remodel projects) and the additional requirements are for a curbless shower to also be “accessible,” or ADA compliant. A few factors are fueling growing popularity in the United States of curbless showers, also commonly referred to as “zero entry” showers. An aging population is a main one. 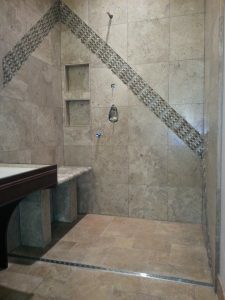 Whether an older individual is “aging-in-place” or has opted to relocate to a community or facility, a curbless shower is often more desirable and sometimes even necessary to help people cope with physical changes that they may begin to experience that can make showering difficult or even dangerous. At the same time, thanks to a proliferation of fashion-forward products and systems that facilitate elimination of the shower curb, people of all ages are “going curbless” purely for the sophisticated, streamlined design. 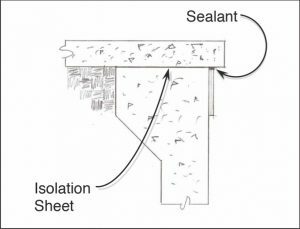 Regardless of the reasons for it, the noticeable shift toward curbless showers is making it increasingly important for building design professionals and tile contractors to know the unique and critical shower design and installation requirements when there will be no curb at the shower entry to function as a dam. Proper planning and high-tech installation materials and shower components are key to containing the water and channeling to a drain, all of which can be applied to the even more challenging goal for the entry into the bathroom to also be transition-free. A shower cannot be totally curbless unless the subfloor where the shower will be constructed is recessed, and the recess is sufficient to accommodate the combined thickness of all the materials below the tile. The size of the shower and placement of the drain(s) are key factors in determining the required recess, as they’ll dictate the required thickness of the floor mud, foam shower base, or other material used to form the sloped base for the tiled shower floor. The installation method or system that will be used is also key, as they vary in thickness. Some are thinner by design specifically to make it easier to construct a curbless shower. 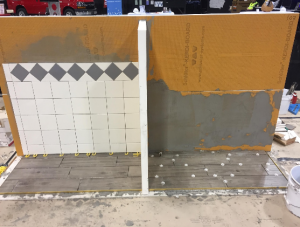 The use of an ANSI A118.10-compliant, thin, load-bearing waterproofing membrane directly below the shower floor tile – instead of a traditional shower pan membrane underneath a mortar bed – results in a lower profile system without sacrificing functionality. 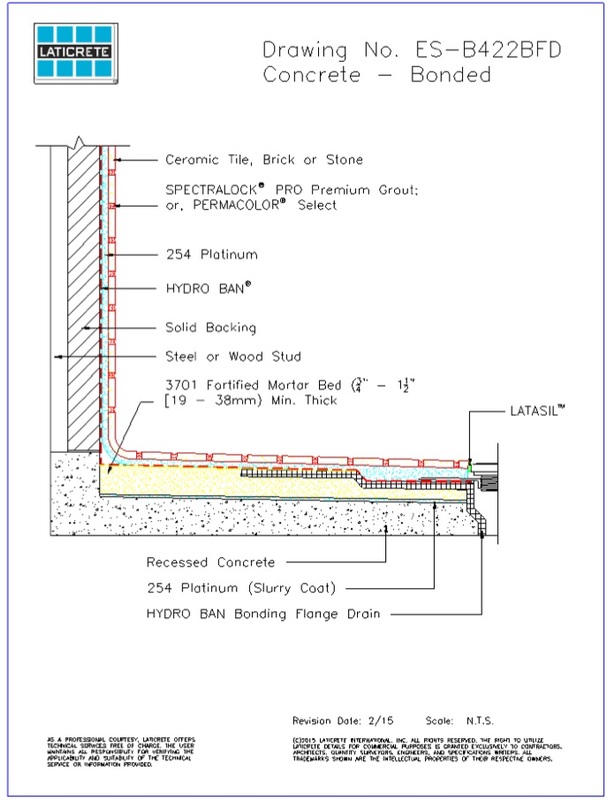 Bonding flange drains and linear drains also offer reduced thickness of the shower base, in many cases requiring no more than 3/4” (mortar bed or preformed pan) at the thickest point, whereas a traditional clamping ring style drain, such as those shown in many TCNA Handbook methods, (e.g. Method B415) requires a 1-1/4” to 2” mortar bed. 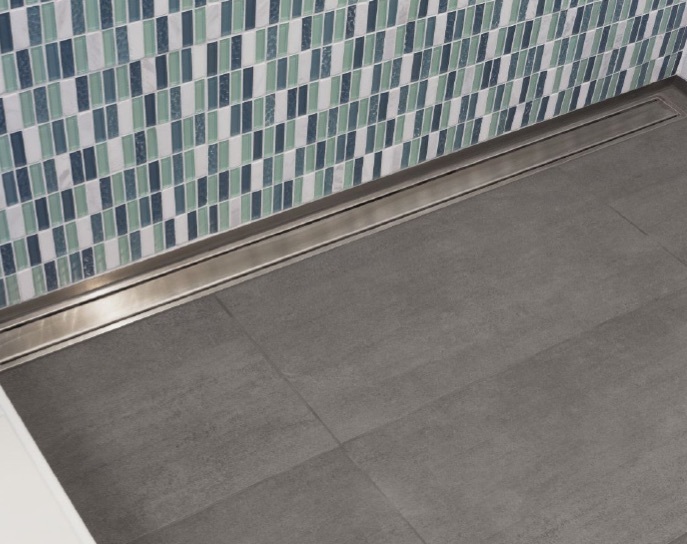 A single sloping plane is possible with a linear drain, which gives a streamlined appearance and allows large tiles to be used; just be sure the tile layout on the walls will facilitate the non-level floor perimeter. 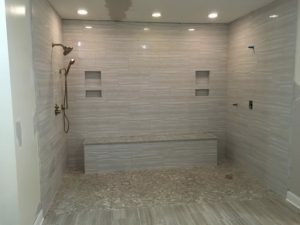 Thus, for the tile contractor to be able to deliver a curbless shower, the specifics of how the shower will be constructed must be determined at the outset so their dimensions can be incorporated into the building’s rough-in plans. This is much earlier than is often the case, which highlights the importance of advance planning when it comes to curbless showers. Another piece of the puzzle is drain location. In many cases linear drains and bonding-flange drains can be located in various places within a shower compartment – at any of the shower walls, at the shower entrance, or mid-floor. 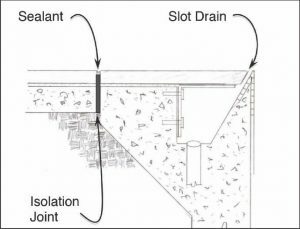 Perhaps more important than its impact on the required floor recess, ideal drain location is critical to how the shower water will flow and drain. Effective draining – versus aesthetic preference – should drive the placement decision. In many cases placement away from the shower entry is optimal. During the design phase, consideration should also be given to defining the shower floor space. In other words, what are the extents of the shower floor? In some cases, in larger showers or open-design showers where the shower floor freely flows into the restroom areas, a secondary drain may be required to collect any water that may flow out of the shower compartment or overrun the main shower drain due to the momentum of the water. Also, showers with multiple heads/jets may require additional drains to handle the water flow. 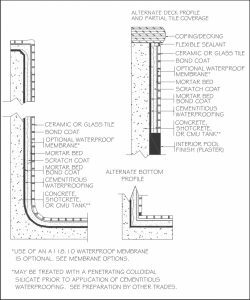 The International Plumbing Code (IPC) requires a slope of 1/4” per foot (IPC 417.5.2 Shower Lining) for shower floors, which is echoed in the TCNA Handbook shower receptor methods. Recessing the subfloor or substrate under a shower allows the finished floor to start sloping from the height of the floor outside the shower, rather than building up a shower base to provide slope to drain, as required when there is no recess in which to countersink the shower base, which therefore requires a curb. Sometimes less slope is specified in a curbless shower, such as 1/8” per foot. In some jurisdictions, a slope of 3/16” per foot or 1/8” per foot could be allowed for a roll-in shower designed to comply with the Americans With Disabilities Act (ADA). However, it is important to note that reducing slope greatly reduces the draining efficiency of the shower. There just isn’t enough slope to properly evacuate the water, which can result in standing water at any given time, a different possible safety concern. 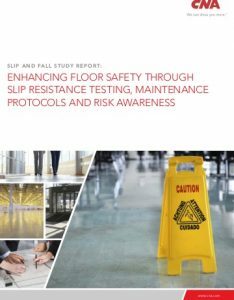 In addition to considering these tradeoffs, design professionals should also consult local building and plumbing codes and officials on a regular basis to ensure baseline compliance with the most current requirements, including the latest ADA parameters when ADA compliance is also intended. Although tile contractors should in theory be able to follow specifications as written, when less than 1/4” per foot slope is specified, it may be worth reconfirming the desired and/or necessary slope with the general contractor and/or project design professional before proceeding. The same could be said for the specified slopes and drains, and the resulting floor recess needed to accommodate them. If a reconfiguration is necessary, a proactive approach might avoid finger pointing and delayed payment later on, or help to build relationships that will lead to more work. But regardless of how or when potential design issues are addressed – some contractors prefer to wait until they’ve been awarded a job – what’s not optional is a good understanding of the critical design elements for curbless showers. Even when it’s a designer’s responsibility to design a shower that’s curbless and drains effectively, tile contractors will no doubt discover – and therefore have to address – various design and rough-in execution flaws as part of the process. At CERSAIE 2018, the seventh edition of Tiling Town event attracted more than 1,000 visitors (+15%), taking advantage of the new CERSAIE layout that brought together exhibitors of installation equipment and materials in halls 31 and 31A. 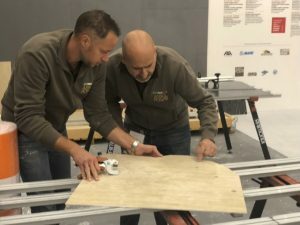 These logistics facilitated meetings between visitors and tile installers and master tile layers from Assoposa – the Italian association dedicated to ceramic tile installation. Tiling Town offered daily showcases of installation work with large-size panels and slabs. ° March 14, 15 and 16. 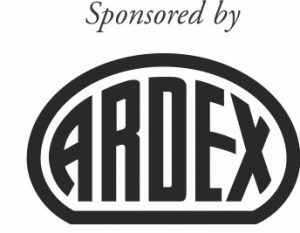 Participation is free and reserved for Assoposa members with the professional tile layer or master tile layer credentials. 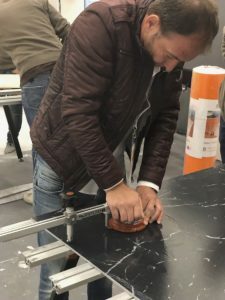 Seminars for architects and designers that qualify for professional training credits in Italy, organized to encourage design projects using these innovative products and to promote the use of large slabs. All problems relating to the new products can be resolved by qualified specialist retailers and installers. A proposal for managing logistics and transport of these new products by drawing up a series of non-obligatory “Good Practices” for the logistics and transport of slabs in coordination with manufacturers, transporters and retailers. 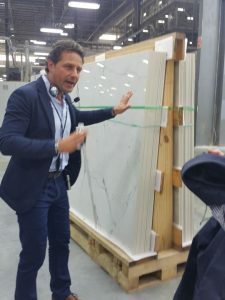 A new layout at Cersaie in halls 31 and 31A facilitated meetings between visitors and tile installers and master tile layers from Assoposa – the Italian association dedicated to ceramic tile installation. Tiling Town 2018 also hosted installations devoted to special cutting and the “continuous vein” effect. 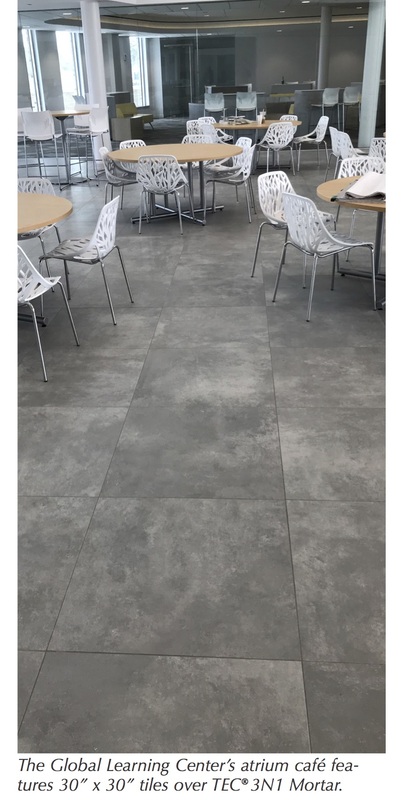 Replicating the successful “RIGHT/WRONG” initiative of previous years, these showcases clearly demonstrated how a carefully designed installation project based on the tile’s vein pattern produces far superior results to a random layout. 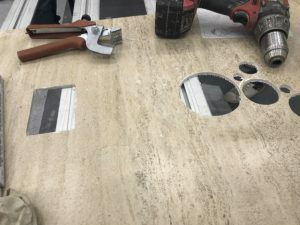 The exceptional aesthetic results achieved in the floor tile waterjet cutting demonstration further underscored the importance of proper installation. Software for online compilation of the Traceability Sheet in accordance with Italian standard UNI 11493 was also presented. This sheet must be issued to the client by the contractor or sub-contractor and must provide an orderly and technically correct description of the key aspects of the operations performed, the materials used and the professionals involved. The Traceability Sheet serves as a kind of identikit of a ceramic tile installation, a document that sets out the key characteristics of a floor installation and validates the work of Assoposa member tile layers. Eight new professional certification courses have been scheduled for the qualifications of tile layer and master tile layer and will be held in the period from October 2018 to March 2019 in the Italian cities of Bergamo, Cuneo, Padua, Reggio Emilia, Avellino, Pisa, Brindisi and Frosinone. Tiling Town offered daily showcases of installation work with large-size panels and slabs. EITA (European Innovative Tile Academy), an advanced training school for instructors, was presented with the aim of promoting training courses for slab layers organized in accordance with a shared European standard at various national levels. 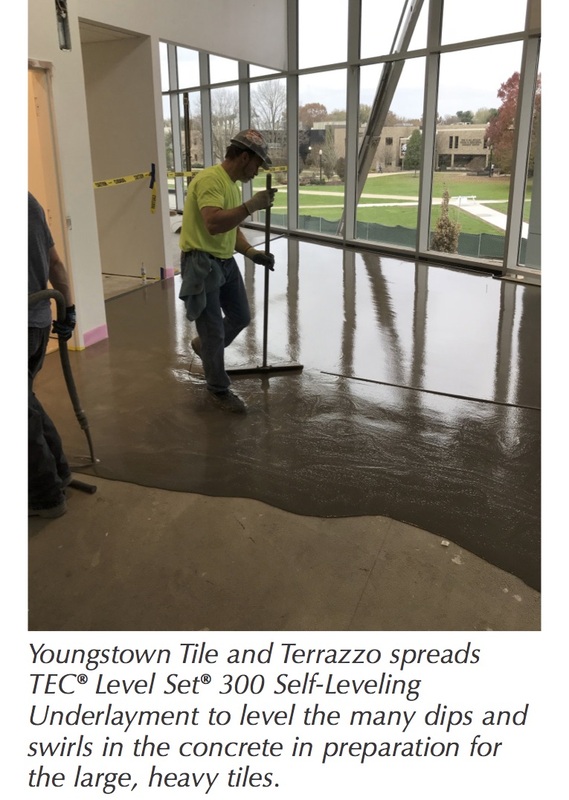 “What five years ago seemed like a dream – the creation of a highly respected association of professional ceramic tile layers and dealers with hundreds of members and a continuous, high-quality program of activities – has now become reality,” commented Paolo Colombo, Chairman of Assoposa. There were three separate initiatives devoted to slab installation. Cersaie 2018 and the activities of Tiling Town also saw a surge in applications for Assoposa membership (30% more than at Cersaie 2017). Following an intense promotional campaign, visitors showed a keen interest in the initiatives organized by Assoposa, including the presentation of a highly popular illustrated tile installation manual entitled “Assoposa per noi” which was distributed free of charge at the show. 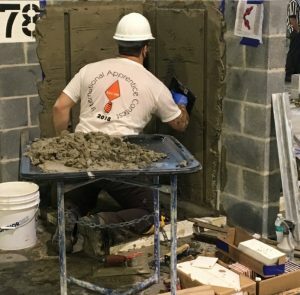 Every three years, the top tile-layer apprentices in the International Union of Bricklayers and Allied Craftworkers (BAC) head to Bowie, Md., tools in tow, to compete for a top score in a rigorous test of hands-on skills and technical knowledge. Organized in conjunction with the International Masonry Training and Education Foundation (IMTEF), which provides training for BAC members and is funded through the International Masonry Institute (IMI), the triennial event celebrates the trowel trades and the trade workers committed to learning them through BAC’s apprenticeship program. A schematic showing what apprentices’ finished test modules should look like. 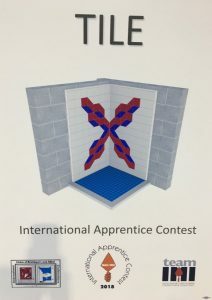 California’s David Perez earned the highest score, but, said IMTEF’s Lupe Ortiz, “They’re all winners.” He explained that the 13 apprentices – who spent a day being closely scrutinized by top BAC/IMI tile instructors and craftworkers from various parts of the country – had won the similar competitions held at the local and regional levels to advance to this final round. Ortiz was one of the contest judges, a role befitting someone who has trained scores of apprentices in California and is known by many in the industry as a stickler for strict adherence to installation standards and quality. He is now a regional director of apprenticeship and training for IMTEF. An apprentice in the final stages of the mortar bed wall portion of the hands-on test. Including wall mud in the curriculum helps keep the ability to produce mortar bed walls from becoming a lost art. An ever-expanding array of backer boards and thinsets has gradually replaced much of the mortar bed work performed by tile setters, especially on walls due to fewer reasons mortar bed walls might be needed. Instead, custom-sized and shaped showers and multi-drain areas like commercial kitchens have kept mortar bed work on floors more necessary. Accordingly, mortar bed work is more widely practiced by residential and commercial installers alike. To prove their wall mud prowess, the contenders had to produce flat, plumb-faced walls with plumb and level perimeter edges, sized to the correct height and width for the tile installed over it. They also had to stay within industry standards for minimum and maximum thickness. In addition to the two adjacent walls being closely inspected for these considerations, evaluators checked the corner where they intersected for squareness. A view of the apprentice contestants working on their modules. 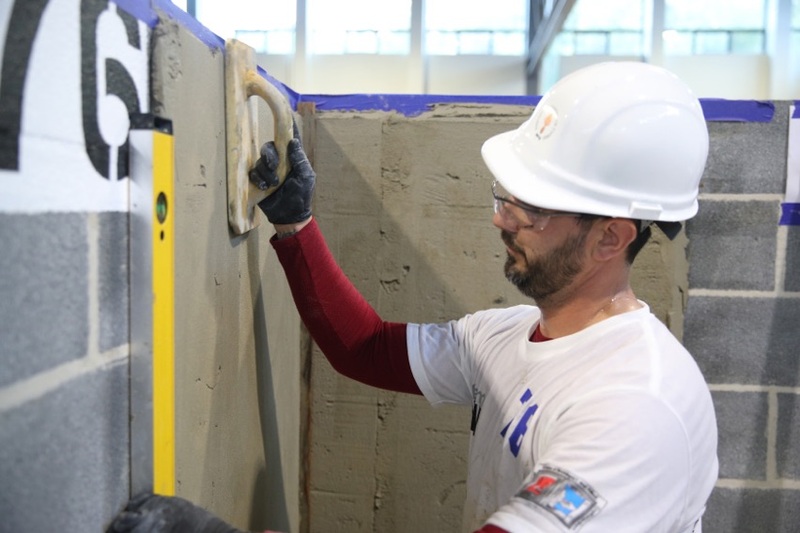 After putting up their wall muds, the apprentice contestants screeded and floated a mortar bed floor, installed tile with a challenging layout and trim pieces, and finished their test modules with grout and caulk. According to Ortiz and Collier, a total of about 40 installation details were carefully inspected and scored by the four journeyman evaluators, who quite obviously took their role seriously. Over the course of the day they compared notes constantly, and quietly but passionately debated their observations to arrive at their final evaluation scores. 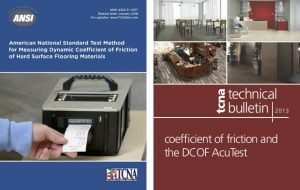 The individual aspects of the test module that they scored were the critical requirements and workmanship standards aimed at avoiding installation failures and aesthetic issues. Combing the mortar correctly to achieve proper mortar coverage is imperative, said Ortiz. “In our trade you have to pay attention to the small details,” he added. Evaluators confer and judge the work of the apprentice contestants. 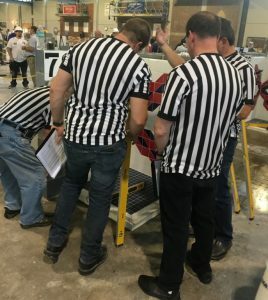 The following day the apprentices took a closed-book written test focused on tile industry ANSI standards and the TCNA Handbook of Ceramic, Glass and Stone Tile Installation. Combined scores were tallied, and Perez was announced champion for the tile division of the contest. Ortiz and Collier have been providing structured education and skills training to tile setter apprentices for several decades and are deeply committed to continued program developments and improvement. At the same time, they acknowledge that the top-performing apprentices’ high skill level is not only a result of the foundational skills built in those classrooms. The contractors they work for and installers they work under day-to-day are a significant influence on apprentices’ development, they said. “What they expect and how they have them do things in the field has to support what IMI trainers are showing them,” said Collier. Apprentices are on the job so much more than they are under an instructor’s tutelage, he added. When it comes to Perez and the other 12 apprentices who competed, it’s clear that this is happening. California’s David Perez was the champion for the tile division of the contest. 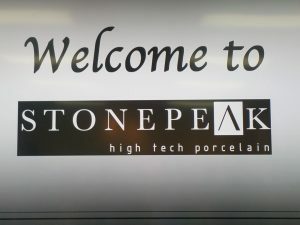 Crossville, Tenn. – On September 12, a group of customers, press, state and local dignitaries, and company management assembled at the StonePeak Ceramics plant here to celebrate the expansion of the first U.S.-based plant to produce 5’ x 10’ gauged porcelain panels. The $70 million expansion adds 160 workers to the facility, which now measures 1 million square feet. Federica Minozzi, CEO of the Iris Ceramica Group, parent company of StonePeak, SapienStone, FMG, Ariostea, Eiffelgres and Fiandre USA, spoke during the ribbon-cutting ceremony, stating that not only is this plant the first in the U.S. to produce gauged porcelain 5’ x 10’ panels, but it’s the first in the world to also offer the capacity to cut those panels to smaller sizes such as 12” x 12”. Panel thicknesses range from 6mm to 2cm. Clays are sourced from the Carolinas, Kentucky and Tennessee to manufacture the panels, said Fiandre USA’s director of sales and marketing Eugenio Megna, who led visitors on a tour through the plant. 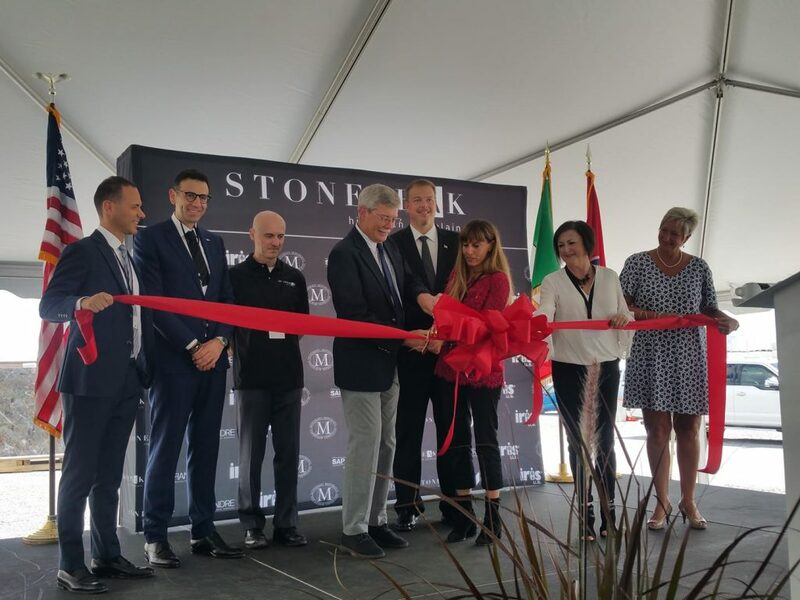 Iris Ceramics Group CEO Federica Minozzi with StonePeak leadership and state and local dignitaries, cut the ribbon on the Crossville Tennessee’s factory expansion. 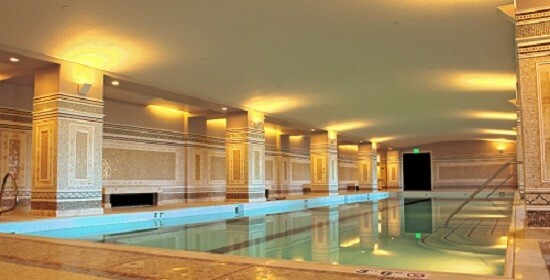 It is the first in the world that produces 60˝ x 120˝ gauged porcelain tile panels and also cut sizes down to 12˝ x 12˝. This $70 million expansion also adds 160 workers and at peak will produce 1,000 panels a day. Fiandre USA’s Eugenio Megna led tours through the new plant expansion. This A-frame filled with porcelain panels is ready for shipping, and holds 25 5´ x 10´ panels on each side. Dignitaries praising the investment in the Crossville, Tenn., local economy included Angela Regitko, business development consultant for the State of Tennessee, Crossville Mayor James Mayberry, and newly elected County Mayor Alan Foster. Foster noted that StonePeak has made a $200 million investment in machinery and its facility since it opened in 2005, and has provided jobs for 400 workers in Crossville. 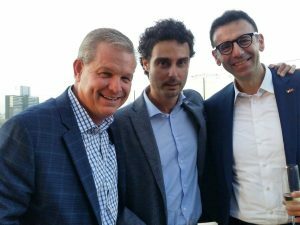 At the post-tour party on the rooftop bar of the Thompson Nashville are (l to r) StonePeak Ceramic’s Todd Ware, exec vp of national accounts;Leonardo Pesce, vp of operations; and Iris’s Marco Portiglia, sales & marketing director. Mediterranea’s Michael (l) and Don Mariutto at the StonePeak afterparty atop the Thompson Nashville. 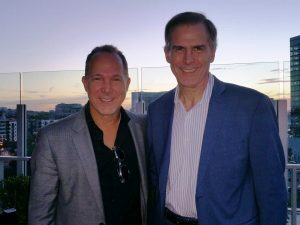 In the evening, guests and hosts gathered for a soiree at LA Jackson, the rooftop bar of the new Thompson Nashville. Mock-ups are great tools for managing customers’ expectations, which in turn can reduce risk and lead to successful installation. Today, we’ll define what a mock-up is, and explain the many advantages of using them. A mock-up can be either a partial or full-size structural model using exact construction materials, specifications and techniques. They allow all those involved to evaluate an actual three-dimensional representation of a project. They also allow us to experience at full scale what could only be hinted at with drawings or small architectural models. Mock-ups allow us to access the functionality, aesthetic and quality of the actual products down to the smallest details. If the old saying “A picture is worth a thousand words” is true, a mock-up must be worth a considerable amount more. Oftentimes, mock-ups are required in commercial projects. It may seem that the additional expense associated with doing a mock-up is unnecessary but, in the end, it allows the team to foresee problems and solve them before they develop on a larger scale. Mock-ups get you involved early and allow you to access jobsite conditions such as: does the site have power, water, correct temperature, and lighting? It gives us the opportunity to establish the needs for a successful installation. 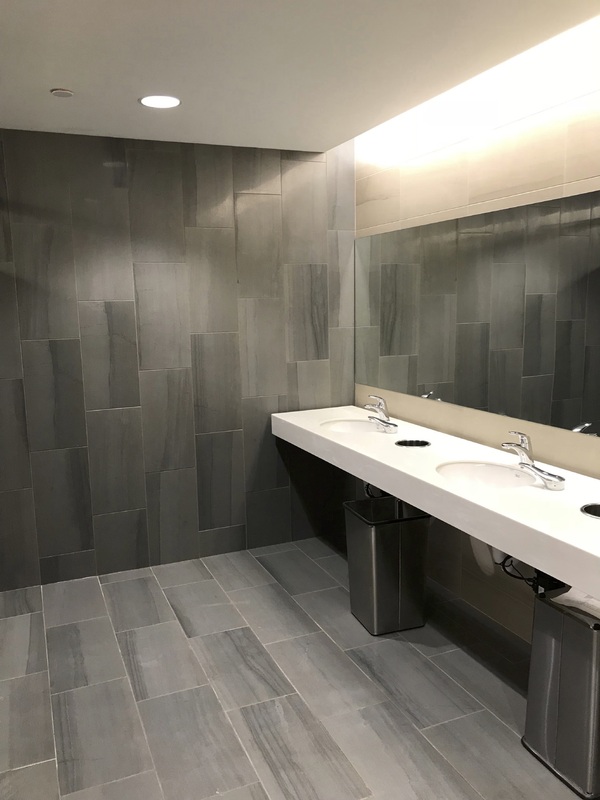 With tiles transitioning to larger and larger sizes, mock-ups help installers set a standard for how flat surfaces must be to install tile. If we run into a problem with poorly-done concrete or framing, we can explain our needs for flat surfaces before they pour the next series of slabs, or frame the next group of rooms. Mock-ups help installers set a standard for how flat surfaces must be to install tile. It seems we are continually pushed by faster and more demanding schedules to complete projects. Timing the installation of a mock-up can be extremely beneficial in determining the amount of total time a project will take, as well as the amount of manpower necessary to reach a desired deadline. Many of us have probably had issues with showroom samples not actually matching the delivered material, especially with stone. Sometimes, a stone sample could have been quarried months or possibly years before the actual stone is selected and ordered. 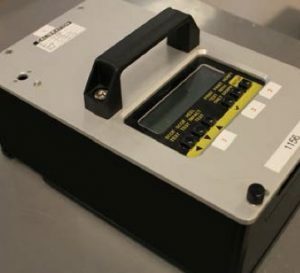 A mock-up shows you the actual current material appearance. Also, when some tiles have highly varied shading, it’s difficult to appreciate the overall look apart from an on-site mock-up with the actual material. 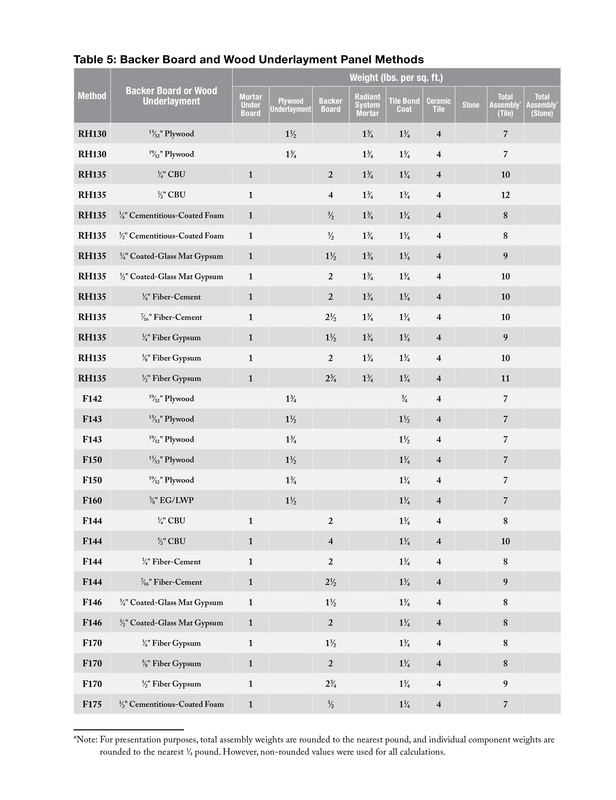 Our industry has Aesthetic Classifications for shade variations that range from V0 to V4. The V0 are the most uniform in shade, while the V3 and V4 are the most varied. When using the more highly varied tiles it takes a larger area of tile to truly appreciate the overall appearance. Shade variation courtesy of Architectural Ceramics. The last few years, the trend has been for smaller and smaller grout joints. It seems everyone loves tile but hates grout. Mock-ups can set an agreed-upon grout joint size. Our industry addresses minimum grout joint size. It states that we should never have a grout joint less than 1/16˝. It also explains that a grout joint should not be any smaller than three times the facial variation of the tile itself. Normally with a calibrated tile that would be around 3/16˝, and with rectified tile it would be 1/8˝. 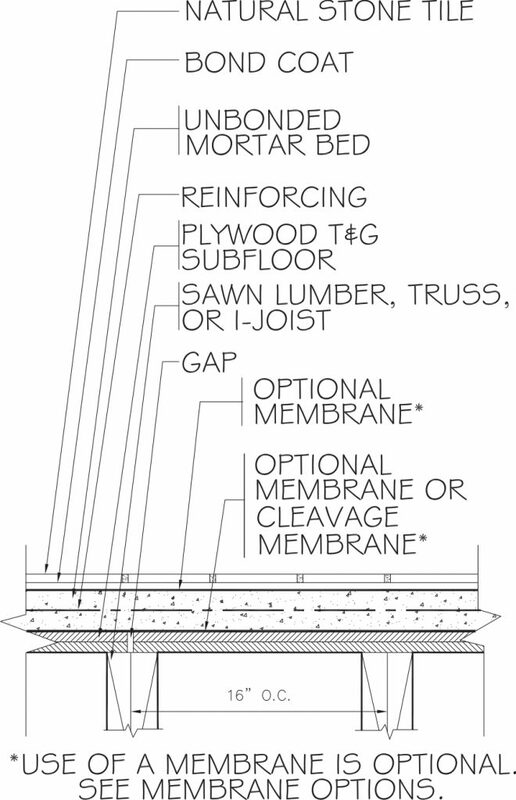 Most of our customers have difficulty visualizing what a 3/16˝ grout joint looks like. A mock-up eliminates that problem and allows the customer to better communicate their desires. Plank and other rectangular shape tiles have grown dramatically in popularity. When tiles are manufactured, they are fired in a kiln. This process can warp the tile or make them bow. When plank or rectangular shape tile are set in an offset or brick pattern, the warpage in those tiles can create lippage in an installation. Lippage is basically when two tiles don’t meet on the same plane. Our industry has addressed this situation and says we should have no more than a 33% offset with tiles over 18˝ in length. It goes on to say if a stagger of more than 33% is called for, a mock-up should be done and approved. One of the many benefits of being a member of the NTCA is technical support. One of the most prevalent calls we receive is about wash wall lighting. The design community has embraced this lighting that is located in the ceiling close to the wall and casts light down the wall and creates an undesirable shadowing effect. The lighting reveals inconsistencies in the wall, tile, and the work. In a large commercial project where this type of lighting is used, a mock-up can be a great asset. Finding out early the effects that light will have on the installation can save a lot of headaches and money. 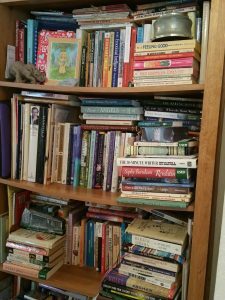 Moving the lights out from the wall can make a huge difference. Discovering this information early from a mock-up makes the process quicker, easier, and cheaper. One thing to consider when doing your mock-up is to be mindful of who you are selecting for that installation and to create the mock-up. If you have a large crew with several installers, there is a tendency to pick your best people to do your mock-up. Remember, this is an example of what the owner will expect throughout the project. Inevitably, we have different employees that work at different speeds with different skill sets. It would be best to pick someone of average skill and speed for your group. This will give a more realistic expectation of what you can deliver. It’s said that it’s better to undersell and over deliver, than oversell and under deliver. Once the mock-up is complete, communicate potential problems, and get a formal acceptance of the installation for the standard on the remainder of the project. Manage customers’ expectations and reduce risk. Every month, NTCA offers free online webinars on a range of topics. Industry experts share their wisdom during these one-hour events that can be watched on a computer, phone, tablet or in a conference room with staff and crew. If you miss a webinar, NTCA archives them for watching at your convenience. Visit www.tile-assn.com and click the Education & Certification tab for news on upcoming talks and archived presentations. 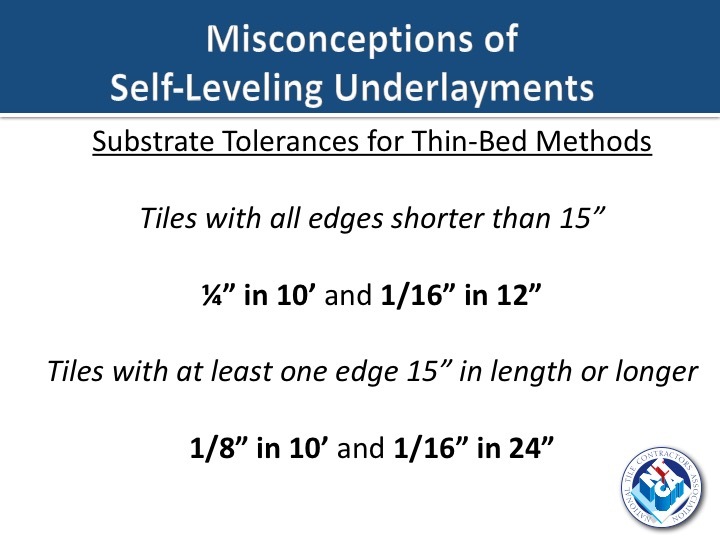 This month, we revisit the March 20, 2018 webinar entitled “Ideal Underlayments and Tile Setting Strategies,” presented by Tom Plaskota, technical support manager for TEC/H.B. Fuller Construction Products – and provide an overview. For the complete webinar, follow the directions above. What are self-leveling underlayments and how do they work? Benefits of self leveling underlayments. They are composed primarily of hydraulic cements such as Portland cement materials and calcium aluminate. These compounds continue to harden under water. 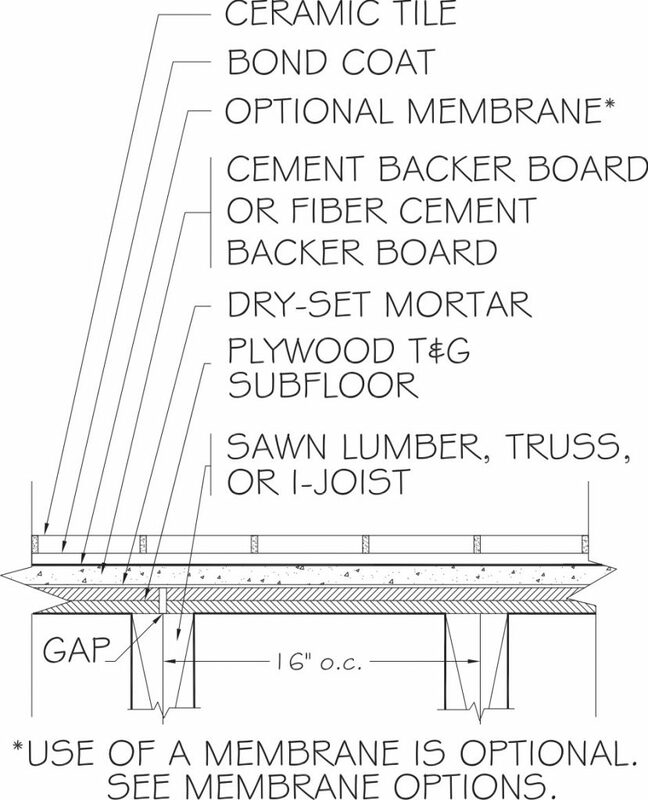 They may require a primer to enhance bond strength and reduce development of pin holes. They are designed and intended to provide a flat, smooth surface for the finished floor covering – ceramic tile or natural stone. Self-leveling underlayments achieve their high-flow properties through the use of flow agents that produce a pancake-batter-like consistency. They are also formulated to be non-shrinking and non-cracking. 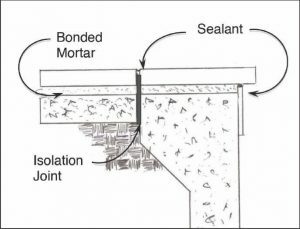 Unlike a thin-set mortar, SLUs are commonly set in thicknesses of up to 1/2” to 2”and are formulated to not shrink or crack at that thickness. 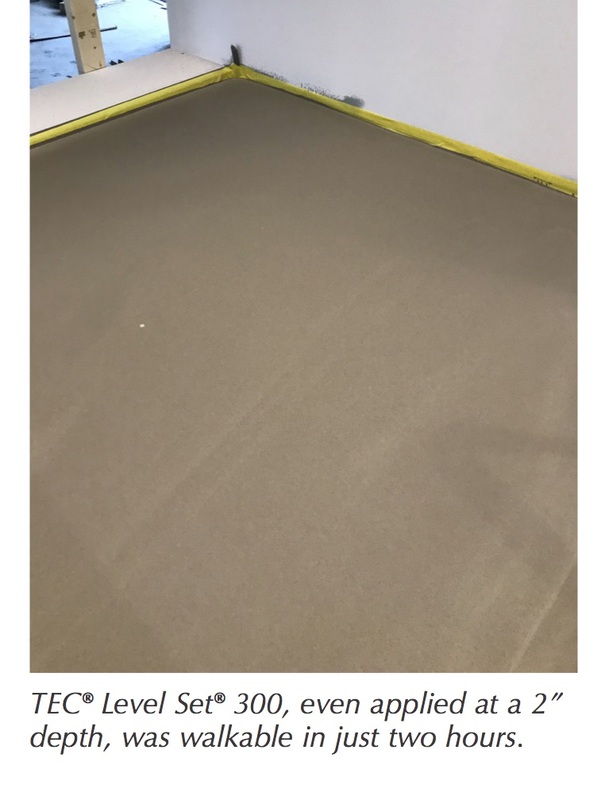 Components like calcium aluminate allow the SLU to cure quickly, so that in many cases, the underlayment will support foot traffic and allow for tile setting in a matter of hours. Plaskota approached the subject of SLU benefits by addressing common questions and objections about self-levelers – and the reality of the benefits they bring. 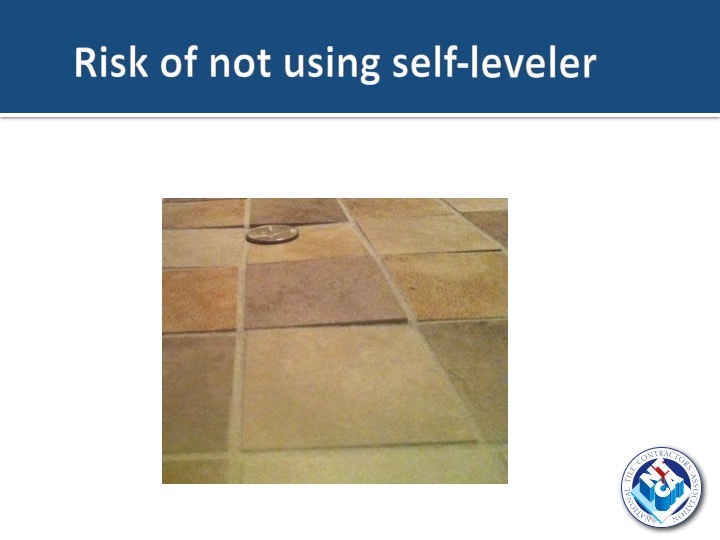 Reality: You need self-levelers for successful tile installations to ensure that the substrate is flat. They help expedite tile installations and save installers from having to make subfloor adjustments, while improving subfloor quality that reduces lippage and cracked or damaged tile. 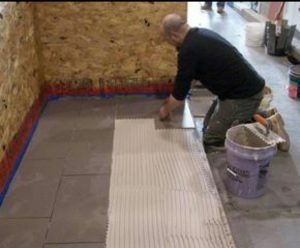 In addition, SLUs help you more easily and quickly achieve the tighter flatness requirements for today’s popular large-format tile, with in-demand tight grout joints: 1/4” in 10’ and 1/16” in 12” for tiles with all edges shorter than 15” and 1/8” in 10’ and 1/16” in 24’ for tiles with at least one edge measuring 15”. 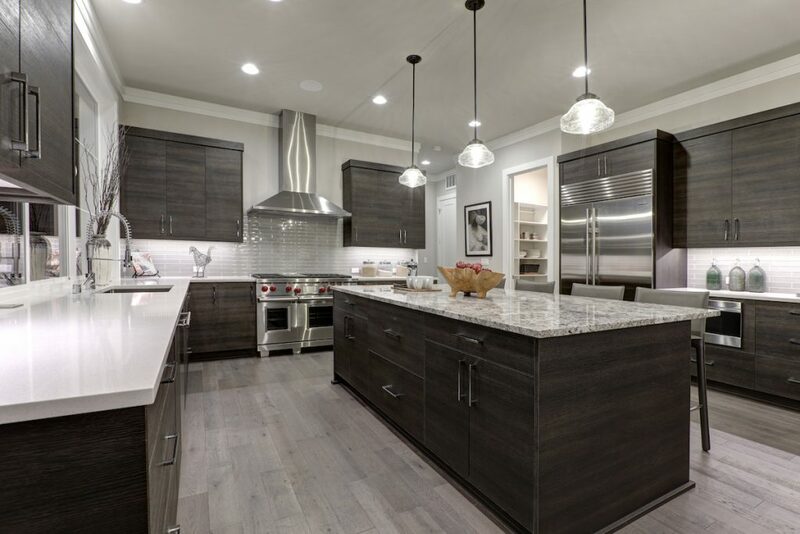 Gauged porcelain tile panels that measure as large as 3’ x 10’ or even 5’ x 10’ are not forgiving when it comes to subfloor flatness and so require the use of SLUs. 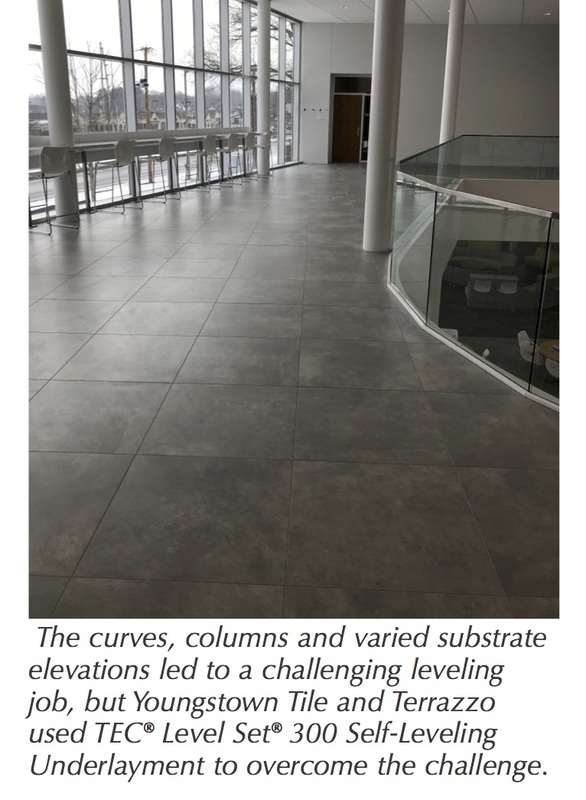 I only need SLU for resilient/sheet vinyl – imperfections in substrate aren’t as ‘visible’ with tile. Reality: The use of bonding mortar to level, flatten or fill substrates does not conform to tile industry standards. Some tile setters mistakenly believe they can “fill” substrates with thin-set or “medium-bed” (now known as large-and-heavy-tile-mortar) mortar. But these products were not made for leveling substrate. Instead, they are designed to accommodate the features of the tile, such as preventing a large, heavy tile from slumping into the mortar. They also address allowable warpage, which is greater in a larger tile, so there’s a need for a bit thicker mortar under the tile to accommodate the irregularity in the tile. Even setting small tiles on an uneven substrate can result in hazardous and unsightly lippage and callbacks. Self-leveling runs up extra charges. 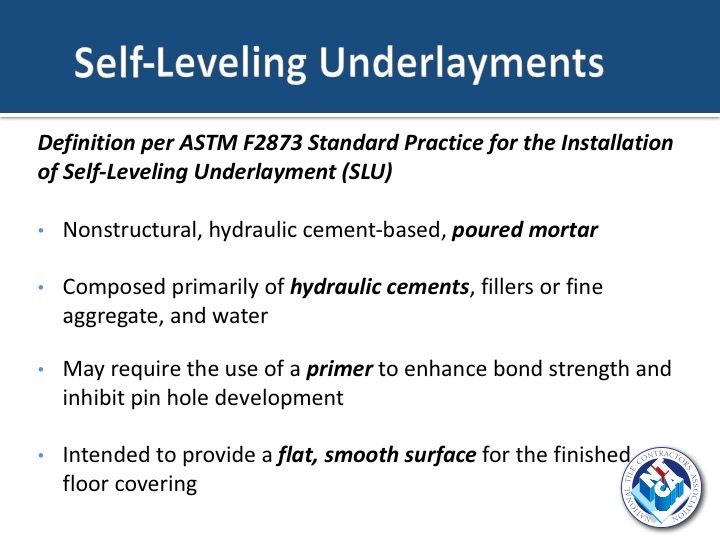 Reality: NOT installing a self leveling underlayment may result in costly call backs. You are going to have to smooth or level your floors. SLU is a great, efficient way of doing that to reduce callbacks. Reality: Efficiencies in installation methods and fast-setting underlayments allow for same-day tile installations. These are not your grandfather’s SLUs – they’ve come a long way and feature enhancements, and advanced technology primers that may eliminate the need for shot blasting over clean concrete, regardless of porosity. They may even go over some types of coatings such as curing compounds, high-performance topical coating like epoxies or cutback residue. In this case, the primer/SLU combo is a great time and money saver. Be sure to consult the SLU manufacturer and confirm the application. In addition, tools and equipment such as rakes, buckets or bucket carts that can be managed by one person can help expedite SLU application. Again for details of this talk, click the webinar link under the Education & Certification tab on tile-assn.com. This link also announces upcoming webinars and houses the archives of talks from the last few years.